Friday April 12: 2-8 p.m.
Saturday April 13: 10 a.m.-8 p.m.
Sunday April 14: 10 a.m.-5 p.m.
Exhibitors may handle the movement of their own materials into the Suburban Collection Showplace - and construct their own booths - using their own labor, carpeting, tables, etc. However, for your convenience, such services are also available from Art Craft Display, Inc., under the terms and conditions noted in their material. Carpeting, tables, chairs, etc., are available from Art Craft Display, Inc. Note also that there is a special "package" available at a discounted rate, see page 4 of the Art Craft Display, Inc. material or you may order online if you choose by going to www.artcraftdisplay.com, clicking the "Exhibitor Kit" tab and entering the event code "300713"). electricity, internet, plumbing, phone, cleaning Please contact BoCo Enterprises for utilities and parking passes. Utilize their online ordering system. From that page you can click through to the Novi Home & Garden Show - or download a copy of the forms for utilities and or parking are included in the Art Craft Display forms. Note that parking during Show hours is available at half-price. Parking during move in and move-out is free. There is no overnight parking. Discounts for Exhibitors are available at the Crowne Plaza in Novi; When reserving your room(s), please enter "HIS" as your group code. The Hyatt Place Detroit/Novi has 124 guest rooms, 2 suites and is connected to the Suburban Collection Showplace. Once booth rental is paid in full and a certificate of liability insurance is received by Show management, the badges will be will be provided. Each exhibitor receives eight badges unless space is larger than 400 sq ft, in which case sixteen badges will be prepared. We require every exhibitor to provide their certificate of insurance. Check the expiration date we have on file for you. If we do not have your up-to-date certificate, click here to open a form you can fax to your insurance agent. Consider our website sponsor Arizona Central Insurance Agency for your exhibitor insurance needs. Click here for more information. Food service is available on site with exhibitors receiving a discount when showing their badge. For a listing of restaurants in the area, refer to the Suburban Collection Showplace website. Click on the "attending an event" tab. Click above to take a tour of our 2018 Novi Home & Garden Show. 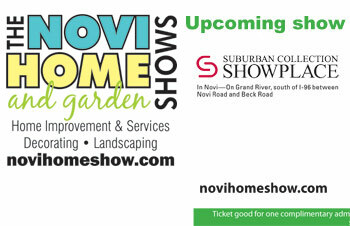 Download a coupon for discount admission to our current Novi Home & Garden Show.